Paul Moshimer, the co-director of Blue-Star Equiculture, the husband of Pamela Rickenbach, a special human being, supporter of animals and working horses, and one of the three members of the Fabulous Old Men’s Club died this morning in Palmer, Mass. In the past year, Paul became one of the closest friends I have ever had. Paul sent me all kinds of writings. Yesterday he sent me a video of the Bob Marley song “Get Up, Stand Up.” He told me it made him think of me, I was not sure what he meant. It is stunning to me that I will not get to ask him. Paul and Pamela got married recently in New York City, they took one of Ariel Fitzi’s magical midnight carriage rides. Ariel was one of Paul’s closest friends, along with the poet Doug Anderson. I am thinking of them today. Paul was always thinking about what it meant to be a man, and we talked often about what it means to be a real man. To us, it mean being supportive, loving, gentle and peaceful. 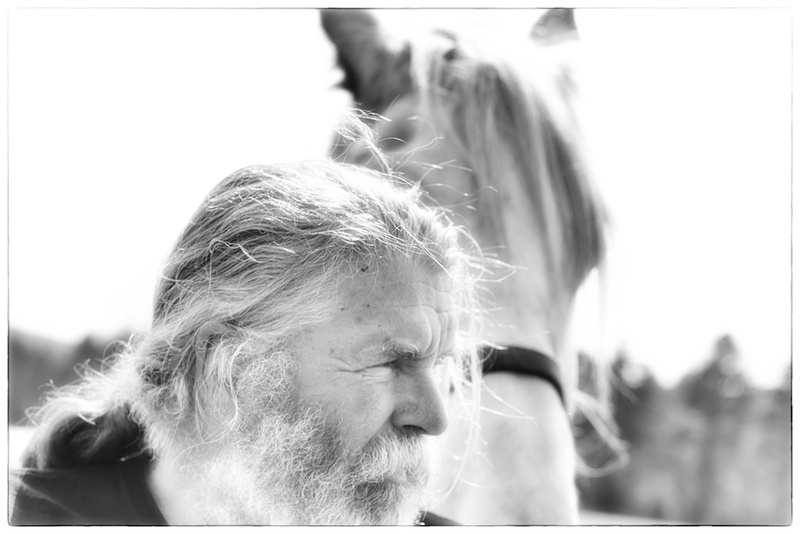 Paul was disappointed that he could not always live up to that idea in his life, but he found his spiritual home at Blue-Star, he devoted himself to the lives of the working horses there, and to the idea that horses and people belong together and that the horses must never be taken away from people. He loved Pamela dearly and struggled to deal with the anger and rage directed at Blue-Star by people who call themselves supporters of animal rights. He told me Blue-Star saved his life and gave it purpose and meaning. He fought for the horses every day. He was a seeker, a thinker, questioner. When I started the Fabulous Old Men’s Club, I thought of Paul right away. Scott Carrino was the other, but we only had one meeting, in Scott’s sugar house a month or so ago. We will have a special meeting in Paul’s honor I hope. Tonight, I plan to go to open mic night at the Round House and read a poem I wrote last night. I will read it in his memory. Strangely enough, it was titled “Towards The Golden Fields.”Maria and I plan to go to Blue-Star this weekend to hold Paul in the light and hold Pamela in our arms. I am so sad to hear of Paul’s death, he was such a good and honest man, such a seeker and thinker, so humble and open. I loved Paul, how could you not? When men find friends like this, it is a miracle. I am so lucky to have known him, so grateful to have spent a night with him when he came up to pick up Sarge, the blind horse he drove down to Blue-Star and has been caring for so devotedly. And so grateful to have spent such sweet time with him at Blue-Star. He leaves a hole in many hearts, I will not forget him. This photo album was one the last things he wrote, it was about Sarge. He asked me to give him writing lessons this fall, I was excited about it. He was a better writer than he knew. Paul was a better man than he knew. To golden fields, Paul, with the soft wind at your back. Should anyone wish to honor such a good and valued person, there is a simple way. You can contribute to Blue-Star, support it’s wonderful work or become a member of the herd.